HOW DO YOU MAKE A 70’S CULT FASHION STATEMENT MODERN AGAIN? Since it’s launch, 70’s inspired shoe-brand Swedish Hasbeens has eveloped a cult-like following for its collection of signature wooden-sole clogs, handbags and belts. The brand re-creates vintage styles with a modern sensibility, securing loyal celebrity fans including Sarah Jessica Parker, Olivia Wilde, and Scarlett Johanssen. With the style-blogger being the new it-girl of the media industry, Swedish Habseens turned to EightSixtySouth to lay the foundation for an integrated influencer program. EightSixtySouth saw that looking to fashion’s newest established tastemakers to style this on-trend product was the next step in elevating the brand’s social awareness. With a strategic gifting and events program, EightSixtySouth developed an on-brand and on-target outreach plan that placed Hasbeens in the hands of Instagram’s most followed. CAN A HOME-TV SHOPPING BRAND BECOME RELEVANT BEYOND THE SCREEN? Skinn Cosmetics, a successful anti-aging skincare and cosmetics line, had established itself as the go-to brand on multiple televised home-shopping networks. The brand was at the forefront of ingredient technology and product development, and continued to attract customers and build a loyal following each year. Yet despite being in over 100,000 homes, Skinn Cosmetics had yet to tap into the younger influencer and editorial market, and had not been recognized by press outside of the home-televised shopping platform. Skinn turned to EightSixtySouth to develop an innovative press and influencer outreach strategy, distributing the product and brand story into the hands of the media’s most influential. Through a comprehensive plan of brand storytelling, product sampling, and events, EightSixtySouth introduced Skinn to a new & diverse market of editors, bloggers and influencers. The resulting press recognition in top tier outlets including Allure, Marie Claire and The Today Show helped Skinn reach a new demographic, as well as continue to build credibility with their existing home-TV shopping network customer base. Meanwhile, strategic social media campaigns and influencer events continue to push the brand into new markets, all while retaining the brand message that Skinn has built over the years. HOW DO WE MAKE MASS CUSTOMIZATION HIGH FASHION? Shoes of Prey allows women to design custom shoes online with over 4-trillion possibilities via their innovative 3D designer technology, tailoring everything from color and materials to heel height and silhouette. The bootstrapped startup’s raison d'etre was simple: every woman deserves her dream shoe. Shaping a new paradigm of commerce, Shoes of Prey’s success hinged on customers rethinking how they shop for shoes, and looked to EightSixtySouth to pave the way. In the traditionally top-down industry, EightSixtySouth saw that Shoes of Prey needed to bring together fashion’s established tastemakers and growing social communities over to this novel product and message. EightSixtySouth developed a market launch plan that leveraged top-down and bottom-up strategies with evocative, on-brand content. Working hand-in-hand with established editors, EightSixtySouth shared the Shoes of Prey message of imagination and trend, and helped The Today Show, ELLE and Style.com broach the new face of innovation. Meanwhile, strategic partnerships placed Shoes of Prey front and center at New York Fashion Week; a national VIP tour inducted influencers to the brand; and blogger and influencer relations drove conversations among social media’s most followed. The result: mass customization was the new black, as Shoes of Prey made their way mainstream. CAN A “CRIMINALLY CUTE” CHARACTER SELL BEAUTY ON YOUR PHONE? Sephora's unique, open-sell environment features an ever increasing amount of classic and emerging brands across a broad range of product categories including skincare, color, fragrance, body, smilecare, and haircare, in addition to Sephora's own private label. Sephora’s launch for an exclusive line of Tokidoki beauty products needed to be fun and interactive in order to both engage the cartoon’s existing fans and connect with the Sephora audience. To promote the launch of its exclusive makeup collection with tokidoki, Sephora selected EightSixtySouth to create an innovative interactive tool to reach its core audience of young women. Taking traditional public relations one step further with a mobile and social media campaign, we created tokidoki me!, an iPhone application that connected the Sephora audience and prominent beauty bloggers with the brand. Knowing that a new makeup purchase often leads to an impromptu self photoshoot, we made picture taking a bit more fun with tokidoki icons that can be layered onto photos and then uploaded to Sephora’s Facebook page. HOW CAN A MINIMALIST JEWELRY LINE CREATE MAXIMUM IMPACT? Finding the beauty in modern simplicity encapsulates the essence of Sarah & Sebastian. Founded by Sarah Gittoes and Robert Sebastian, partners in both business and life, each collection is filled with clean lines that are skillfully paired with intricate design elements. The result is the perfect balance in each piece created, a collection that finds that happy medium between restraint and indulgence. Each object produced is edgy yet the result of a thoughtfully considered design process. Always adhering to an honest manufacturing process, Sarah & Sebastian hand makes every piece in Sydney. The appreciation for the handmade aesthetic and process lies at the heart of the label, resulting in the creation of jewelry that is personal, sentimental, delicate and original, while still pushing the boundaries of sophisticated, innovative design. A dynamic label already making it’s mark on the Australian Market, Sarah & Sebastian turned to EightSixtySouth to assist in building the brand’s presence in the US. With a thorough understanding of the accessories market, EightSixtySouth created a strategy that placed Sarah & Sebastian in the hands of top-tier editors, stylists and influencers, garnering coverage on the right people and in the right places, setting the brand up for success as it entered the stateside fashion arena. With its introductory collection, Sarah & Sebastian garnered immediate attention from a variety of media as editors and stylists gravitated toward the minimalist yet edgy collection. From recent press placements in fashion publications such as PORTER, Refinery29 and InStyle.com, as well as New York Magazine’s The Cut, The Zoe Report and Interview, Sarah & Sebastian is positioned to make a maximum impact in the US market. Beyond the fashion pages, the brand continues to gain favoritism among influencers and celebrities alike, building a loyal fan base that includes Courtney of Always Judging, Danielle of We Wore What and Kylie Jenner. HOW DO YOU TAKE LA’S PREMIER SALON BEYOND THE PAPARAZZI SPOTLIGHT? When two of the most recognizable names in the hair industry joined forces, it’s no wonder the resulting business was an instant success. Founded by long-time friends and colleagues Tracey Cunningham and Neil Weisberg, Mèche Salon was poised to become the next celebrity and industry go-to destination, ushering in a new standard of Beverly Hills salons. While often overshadowed by the glitz & glam of its celebrity clientele, Mèche was looking to further position itself as an expert in the industry, not only for the founders, but for its carefully selected team of stylists & colorists. Neil and Tracey had curated a veritable who’s who of the industry’s best and brightest, and it was time they received the recognition they deserved. Mèche turned to EightSixtySouth to create a diversified press strategy, seeking coverage not only for the salon and its celebrity clientele, but also the talent within. Beginning with an in-depth discovery process to understand each individual’s strengths and talents, EightSixtySouth developed a comprehensive press strategy that included editorial outreach, brand storytelling, influencer relations and social media content development, introducing Mèche and its team to a diverse group of editors, influencers and industry insiders. Within the first year of opening its doors, Mèche Salon garnered immediate attention from a variety of media as editors and influencers gravitated toward the burgeoning talent, high-profile clientele & resulting testimonials. With press placements in top-tier publications Harper’s Bazaar, Vogue, InStyle and Allure, as well as hightraffic websites including Refinery29, Byrdie and Total Beauty, Mèche was becoming the go-to industry hair resource and destination in LA. HOW DOES A BEST KEPT SECRET BECOME AN INDUSTRY AUTHORITY? Our initial research found that Mana was relatively unknown to the general public despite their extensive industry knowledge. In order to increase awareness of the company, we created a distinct and evocative brand that resonated through all online experiences. Developing a library of images from their impressive NYC-based lab as well as behind the scenes imagery from top fashion shows helped create an expressive and immersive image-driven online experience that showcased the brand and set a new standard in the industry. The revised image library as well as a new icon system based on their original identity is helping Mana create buzz around their brand while retaining brand equity they built throughout the years. Setting new standards for imagery and branding systems in the beauty industry, Mana continues to innovate with new products and offerings in collaboration with EightSixtySouth. CAN AN APP TRANSFORM A LOCAL CRAFTSMAN INTO AN INTERNATIONAL DESIGNER? Brooklyn’s finest maker of modern luxury furnishings was looking for a new way to showcase the high quality of their products. Hellman-Chang needed an immersive way to demonstrate the process and craftsmanship behind their stunningly beautiful, high-end furniture. Together with Hellman-Chang, EightSixtySouth designed and developed an app that allowed users to intimately explore each product from its rich and honest beginnings. into a new level of global recognition and kick started their 2013 brand and marketing campaign. marketing campaign, Hellman-Chang transitioned to EightSixtySouth’s PR team to continue the momentum, securing placement in top-tier publications including Architectural Digest, ELLE Decor and Interiors & Sources. CAN SOPHISTICATED SWIMWEAR STAND OUT IN A SATURATED INDUSTRY? Sophistication meets functionality in Beth Richards’ swimwear. The combination of comfort, clean lines, and quality fabrications in monochromatic tones creates a range of practical swimwear that transitions beyond the beach. Vancouver-based Beth Richards, set on standing out in an industry soaked with swimwear brands, turned to EightSixtySouth to increase the brand's visibility in her target market. With a strong understanding of the swim industry, EightSixtySouth developed a detailed editorial outreach strategy to carefully cut through the clutter and place her swimwear in top-tier media publications. Leveraging their relationships with top tier editors and stylists, along with the unique qualities of the Beth Richards brand, EightSixtySouth secured placements in some of North America’s most influential publications and blogs including ELLE, Galore, InStyle, Self, Who What Wear, The Zoe Report, and Refinery29. CAN SWIMSUITS MAKE A SPLASH WITH U.S. STYLE MAVENS? By fusing art, fashion and swimwear, We Are Handsome has become the go-to brand for celebrity style makers worldwide. With over 16 collections under their belt, as well as the introduction of four activewear capsules, designer Jeremy & Katinka Somers turn swimwear into spellbinding works of art. With colorful palettes and exquisitely shaped cuts, We Are Handsome’s cult celebrity following continues to grow, including international style icons such as Beyonce, Rihanna, Florence Welch, Blake Lively, Iggy Izalea, Katy Perry and Sarah Jessica Parker. With an iconic product and sights set on US waters, Australian prêt-à-porter swimwear label We Are Handsome turned to EightSixtySouth to handle the North American launch of its visionary range. Understanding that of utmost importance was making a splash beyond the swim category, allowing for growth and longevity as a design house, EightSixtySouth executed a comprehensive media and tastemaker outreach program. 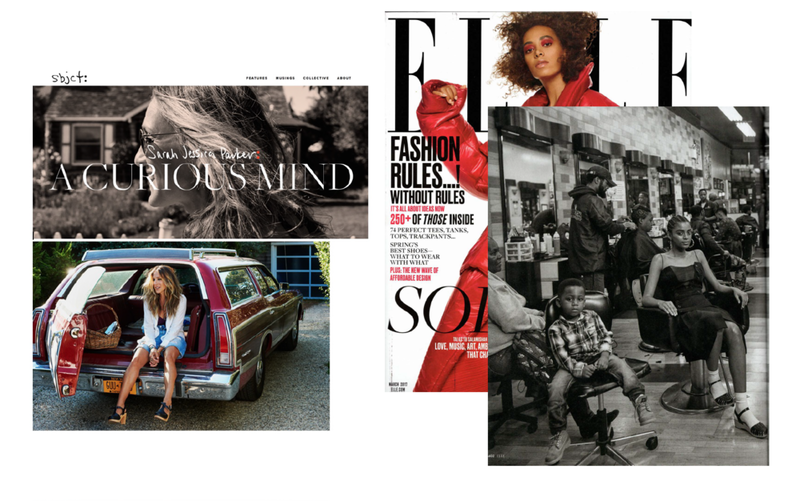 With a creative and detailed market launch strategy, EightSixtySouth helped the media jump on board: everyone from influential publications – Vogue, The New York Times, WWD, Style.com – to social media networks – featured on over 2,000 blogs – to top retailers – picked up in Tier A boutiques on both coasts – and touted trendsetters – instant celeb fans Rihanna, Diane Kruger and Fergie. We Are Handsome was making waves, all in its debut collection. As one of the company’s longest standing clients, EightSixtySouth continues to make strides with each new collection, executing press worthy partnerships, celebrity placements, events and traditional media coverage. The brand persona of We Are Handsome is simple, to live in a never ending summer. The swim label looked to EightSixtySouth to share this eternal summer lifestyle and love of following the sun with the US market. EightSixtySouth looked to the travel content Handsome organically produces in its search for inspiration as the key to sharing this message. EightSixtySouth developed a travel contributor campaign that leveraged We Are Handsome's love for adventure, and desire to soak up the sun around the globe, and turned it into an exclusive partnership program. Using the brand's existing inventory of imagery and knowledge from breathtaking destinations, EightSixtySouth posed the team as experts and tastemakers in stylish travel to top lifestyle publications as exclusive fashion and travel content. Through outlets like Conde Nast Traveler, Harper's Bazaar and StyleCaster, the story of how the We Are Handsome team lives a never ending summer was shared. From places to shop and sites to see, We Are Handsome become sought-after travel contributors for sun-soaked guides to destinations like the Maldives, Hamilton Island and Cape Town. In subsequent seasons, the EightSixtySouth expanded this outreach to include tourism boards around the country, securing travel partnerships for the brand in destinations including Bali, Sri Lanka, Curacao and Thailand. HOW CAN A CRYSTAL JEWELRY COLLECTION MAKE A CONNECTION WITH THE MASSES? Australian accessories brand Krystle Knight Jewellery harnesses the beauty and healing properties of crystals in their purest form. Upon discovering that there are two worlds - the one you can see and the one you cannot - designer Krystle Knight sought to create a line of beautiful and powerful jewels that connect with the spirit within. From modern takes on of-the-moment trends to classic crystal jewelry, Krystle Knight continues to be at the forefront of both style and spiritual living. Already an established brand down under, Krystle Knight Jewellery came to EightSixtySouth with the goal of expanding their US presence and sharing their unique, positive vision. Understanding that an integrated approach makes a solid and lasting connection, EightSixtySouth sought to place the brand on both editorial and influencer outlets, as well as create opportunities to promote the brand story through experiential events, positioning Krystle Knight Jewellery as the premier in spiritual crystal jewelry throughout the US and beyond. 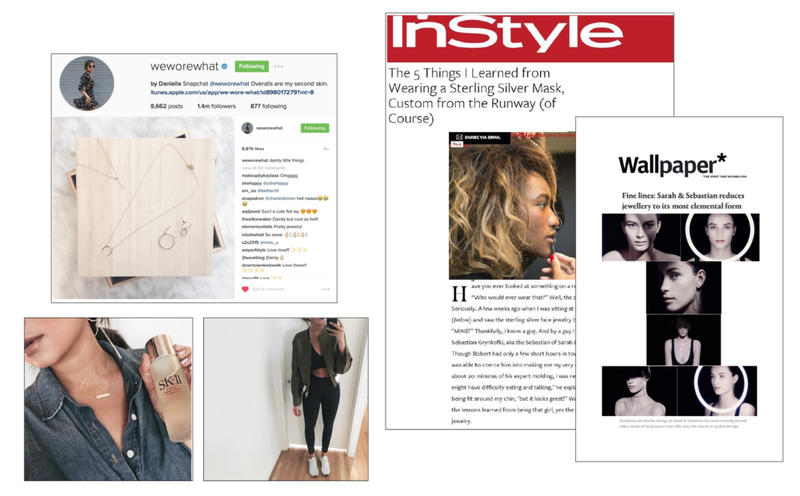 From developing a cult influencer following with top tier influencers including Aisha Jade, Sivan Ayla, and Sophie Elkus, to securing placements in a variety of national and regional publications, EightSixtySouth continues to work with KKJ to make their mark on the US market, resonating with key figures in the US fashion & lifestyle scene. Beyond the pages, EightSixtySouth has brought the brand to life through experiential collection previews at tailored and trending LA locations including Gracias Madre and E.P. & L.P. With a capsule collection in the works, Krystle Knight's spiritual connection appears to only be getting stronger. HOW TO MAKE YOU A FASHION-FORWARD SWIM BRAND ACCESSIBLE TO THE MASSES? Engineered and designed with quality construction and materials in the heart of Australia, Kopper & Zink’s custom prints and fluid finishes create a collection of swimwear that flatters and accentuates the female form. Designer Sally Burgess has redefined edgy sophistication in swimwear, utilizing a mix of bright solids and bold prints, rendered in unique silhouettes. With an eye for detail and goal to make a splash in the US market, Kopper & Zink turned to EightSixtySouth to handle the North American launch of the fashion-forward swimwear. Understanding the designer’s need for impact and desire to make every woman feel comfortable in her skin, EightSixtySouth executed a comprehensive media and tastemaker outreach program for the collection that would leave its mark in the States. EightSixtySouth’s work pushed Kopper & Zink into a new level of national recognition and kick started their influencer following. With a strategic gifting program, EightSixtySouth developed an onbrand outreach plan that placed Kopper & Zink in the hands of Instagram’s most followed. Influencers include, Becca Tilley, Kyra Santoro, Jessica Alba, Hailey Baldwin and Gabrielle Grace Epstein. In addition to landing the suits in the hands of top-tier influencers, Kopper & Zink has been seen in both national and regional publications including SELF, Sports Illustrated Swim, Women’s Health, Health, Cosmo, ELLE and several others.